The Sri Lankan government said Saturday it will honor a four-year cease-fire despite stepped-up clashes between soldiers and Tamil Tiger rebels that have killed nearly 30 people in recent days. "So far...we are going to honor the cease-fire," chief government spokesman Keheliya Rambukwella told The Associated Press after the guerrillas said the clashes indicated the country is heading back to a full-scale civil war. "We are going to exercise restraint, as we sincerely believe that war is not a solution," Rambukwella said. Fighting on Friday killed at least 16 people, the Red Cross and rebels said Saturday. The military said 13 soldiers were missing, of which as many as 12 may have died, after the clashes in a village in eastern Batticaloa district. "I am not able to confirm that until we get the bodies. So far as we are concerned, we have listed the soldiers as missing," military spokesman Brig. Prasad Samarasinghe said Saturday. He said Friday another four soldiers were wounded. A spokesman for the International Committee of the Red Cross said he expected the soldiers' remains would be returned to the military later Saturday. "We have been told that there are 12 bodies of Sri Lankan soldiers and we are getting ready to receive them" from the Tamil Tigers, Sukumar Rockwood said. Samarasinghe said he had information that at least 10 Tamil rebels were killed in Friday's clashes, but there was no independent confirmation of that claim. 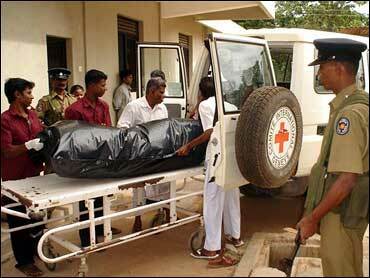 The pro-rebel Web site TamilNet reported Friday that four rebel fighters were killed. A spokesman for a Nordic cease-fire monitoring mission confirmed the fighting in Kulathumadu village, about 140 miles east of the capital, Colombo. Samarasinghe denied that troops had knowingly entered the rebel-held area, saying there was no way of knowing they had left government-held territory. Under a Norway-brokered cease-fire signed in 2002, both sides are prohibited from entering each other's territory with arms. More than 750 people have been killed in escalating violence, especially in Sri Lanka's north and east, since December, raising fears that the island nation could plunge back into full-blown civil war. "Friday's incursion ... marks a degree of escalation in the long-running 'low intensity war' between the [rebels] and the Sri Lankan military," TamilNet said Saturday. The Tamil Tigers - formally named the Liberation Tigers of Tamil Eelam - have fought the government since 1983 for a separate homeland for the country's 3.2 million ethnic Tamil minority, accusing the 14 million Sinhalese of discrimination. More than 65,000 people were killed in the conflict before the 2002 truce.